I am continuing with this water purification series and Everything about water! I briefly went into Phytodepuration, so now we are going into the different benefits of different plants used in this process. My last blog post on hemp was controversial. Bamboo is a plant that is known as being one of the fastest growing plants on Earth. Additionally considered as Lucky and is a big part of Feng Shui. Sustainable Technologies found a method called AFADS. Anaerobic + Phytodepuration + Aeration + Solar Distillation is their equation for neutral CO2 Emissions in the Food Industry tackling wastewater. For CO2 purposes bamboo grows four times faster than most plants as well as takes in more carbon than trees. Additionally bamboo will reduce our extreme pressure on the forest by being a substitute for wood in furniture, floor panels, fiber panels, and many other products. Because of Bamboo’s of its high intake of water required to grow makes an additional reason for a good choice of Phytodepuration. 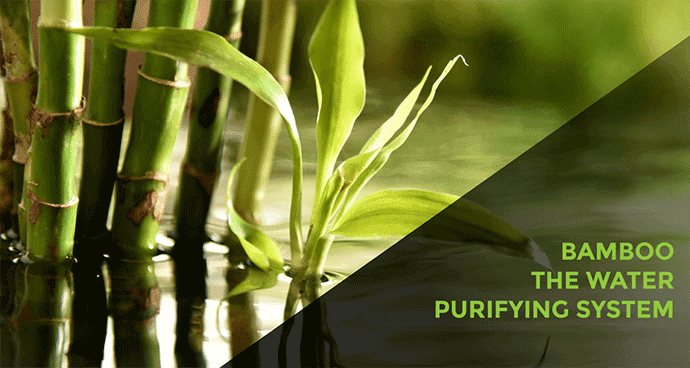 Consequently, wastewater treatment using bamboo can then take the water for ferti-irrigation. Frédéric Panfili of France’s Phytorem is the project’s scientific manager. This system is designed to use Phytodepuration to treat Greywater and blend into the surrounding landscape. He commented regarding the massive amounts of greywater produced by the restaurant industry. This system, in particular, is cleaning the greywater from Délifruits factory near Valence, in France, which produces soft drinks. This project took off and caused multiple other systems in wastewater management plants in Europe to do the same process. Up to this point in the series, we focused on greywater or harvested water systems let’s go somewhere closer for most people our faucets. I want to give a quick Disclaimer, World Permaculture Association or myself personally Giuseppe Tallarico don’t sell Purification Systems, or get any affiliate commissions from any water purification systems. My suggestions are simple suggestions based on science and experience. Looking at Bamboo Charcoal Filters available for purchase on Amazon, most seem to remove ammonia, lead, mercury, cadmium, copper, chlorine, and chlorides from the water. The filters are super cost effective and, don’t require massively expensive in-home filtration systems. The Bamboo Charcoal doesn’t leave any residue or bad taste to the water. They cost between five dollars and fifty dollars depending on brand and quantity. Who doesn’t love a Do- It- Yourself project? Especially when it’s going to provide fresh clean drinking water. I even have a special tip on what to do with the used charcoal filters once you have to replace them! First, you will need to gather your supplies a glass pitcher, bamboo charcoal sticks, tap water, and a pot. Boil the Bamboo Charcoal Sticks for at least ten minutes. Once it has boiled for ten minutes remove from the pot of water. When it’s dry place in the glass pitcher along with the tap water. It’s then READY to drink! These instructions are generally speaking if the instructions differ on the Charcoal Sticks, please follow those instructions. One stick will last up to four months of purifying water (this also will vary by manufacturer) but then could be used for deodorizer, or in your soil as biochar for water retention. A few other mind-blowing tricks for these bamboo charcoal sticks are AIR FILTRATION: Absorbs harmful chemicals and substances from the air. Also, ELECTROMAGNETIC SHIELDING: Many electrical appliances emit electromagnetic radiation that can raise your body temperature and cause backaches. Bamboo Charcoal absorbs this radiation, helping to improve the environment in your home and office. Put a Charcoal stick in the Crisper drawer in your fridge to keep your produce fresher longer and fight against bacteria, fungi, and harmful chemicals. I have said this over and over again water is life and, I’ll say it AGAIN! We need to make massive changes to water purification, water usage, teaching and promoting Water Recycling! Phytodepuration and growing hemp and bamboo are going to fight water usage, but also replacing our wood, paper, and plastic products are going to continue our efforts with plastic pollution, desertification, and deforestation. Which are a huge change for the earth and our next generations!